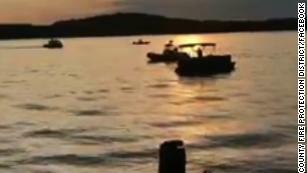 (CNN)Tia Coleman's thoughts as she struggled to swim to the surface of the lake were focused on her family. "I said, 'Lord, please, I've got to get to my babies. I've got to get to my babies," she said Saturday at a news conference at at Cox Medical Center Branson, where she has been hospitalized since the incident that took 17 lives, including her husband, three children and five other members of her family. "In our family, my oldest son is autistic so a lot of things normal families do, we don't always do," she said. Passengers were told there was a storm coming before they went out on the water, Coleman said. The captain mentioned life jackets before they went onto the lake, she added, but he said, "you won't need them so we didn't grab them." Coleman said she thinks if she had been able to get a life jacket to her children -- she had a son sitting next to her -- she could have saved them. "I felt like, if I was able to get a life jacket I could have saved my babies because they could have at least floated up to the top and somebody could have grabbed them. And I wasn't able to do that," she said. "The harder I was kicking to the top, I was pulled down," she said. When asked whether she is happy she made it out alive, Coleman said she doesn't know yet and only time will tell. But she thinks there is a reason she survived. "God must have something for me because there's no way I should be here," she said. 0 Response to "Duck boat accident survivor mourns her 9 relatives who drowned"